The competitive frontier for technology today is defined by the notion of "customer experience". It is a term many are using but few understand. How do you deliver on customer expectations when developing and deploying new technology? We know that quality is vital to delivering successful customer experiences, but whether technology 'works as expected' is no longer enough. It has to have Human Quality, the type of quality that is planned from the beginning. It has to take full account of the way people 'really' use technology, their engagement and ultimately their loyalty. Our proprietary Human Quality Toolbox allows us to assure and test technology in an integrated way, from planning and requirements, to lifecycle testing and then through to customer acceptance and satisfaction. Human Quality isn't something you achieve once. It is an organisational mindset, which requires you to pay attention to every element in the process of delivering great technology and to constantly look for ways to improve on it. 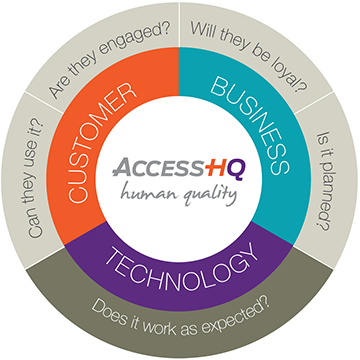 That's where our Human Quality assurance services come in. Whether you want to review and improve the quality assurance processes that your technology team uses, or provide some independent governance and management to your existing projects, AccessHQ has the assurance services for you. Testing and innovation are at the heart of our Human Quality Toolbox. From functional testing through to performance, security, compatibility and usability testing we offer you a complete range of testing services for enterprise systems, websites or mobile applications. We understand that people's expectations of how technology should perform have grown dramatically over recent years and our testing approach reflects this. While everyone else is commoditising testing we are customising it to the new customer experience paradigm. Nobody integrates testing like we do and this makes us your ideal testing partner.